Canoes are carried upside down. 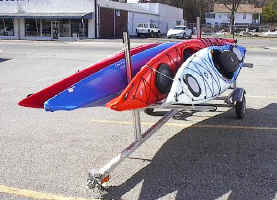 Kayaks are carried upright or strapped together side by side on the SUT-250-M-2 dual canoe and kayak carrier. 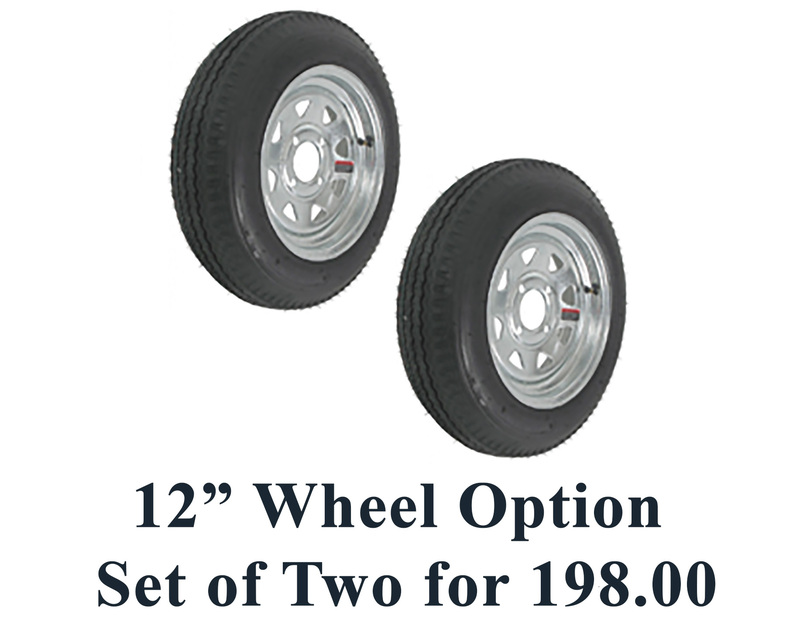 This model can carry two canoes or up to four kayaks, or you can mix canoes and kayaks. See our Model SUT-220-S for carrying a single kayak upright. 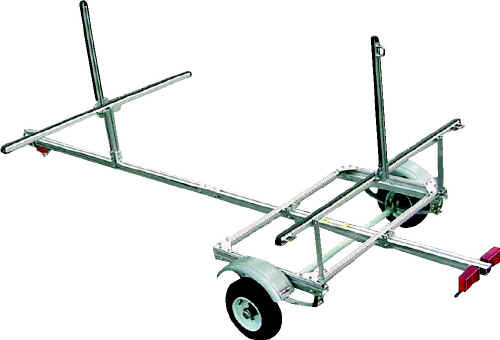 Model SUT-250-M-2 Multiple Canoe Trailers has epoxy coated leaf springs, giving it a carrying capacity of up to 250 lbs. SUT-350-M-2 has a 350 lb capacity and a longer tongue. 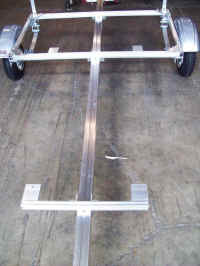 This trailer is packaged for UPS shipment, and is easily assembled using only simple tools. 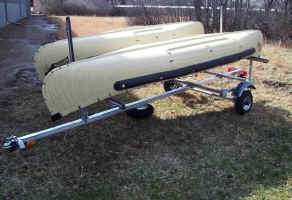 Since the Dual Canoe Trailer is made of aluminum, it is maintenance-free in addition to being strong and lightweight. 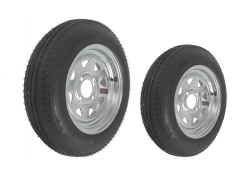 It's light weight allows towing with today's smaller vehicles. 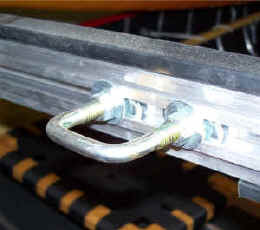 Trailer also has two center Vertical Supports for tie down support . The two vertical risers can be positioned at any point along the T bars. You could add an additional set of MKP vertical risers to the Trailer to provide vertical support on both outer ends of the T-Bars. 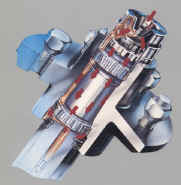 * BMK is a kit that allows you to mount your own box to the Model SUT-250-M-2 or SUT-350-M-2 Trailer. 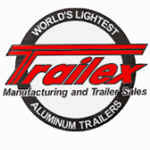 You can mount low cost metal or plastic truck storage boxes available from most large stores or automotive stores. These boxes are typically 72" long, so although they would fit canoe paddles, kayak paddles would have to be of the take-apart type. 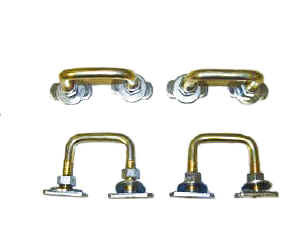 Alternatively, you could build your own box and mount it to the trailer with this kit. NOTE: Box weight plus boats cannot exceed 250 lbs on SUT-250-M-2 and 350 Lbs on SUT-350-M-2. Box can be mounted anywhere along the tongue - even under the boats - check dimensions before obtaining a box. 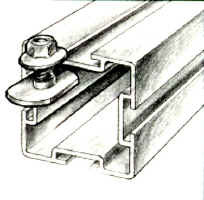 Kit consists of a front crossbar and 4 brackets.. The box mounts atop the tongue in the same direction as your boats. Two Canoes are carried upside down, side by side. Canoes & Kayaks can be mixed or matched.